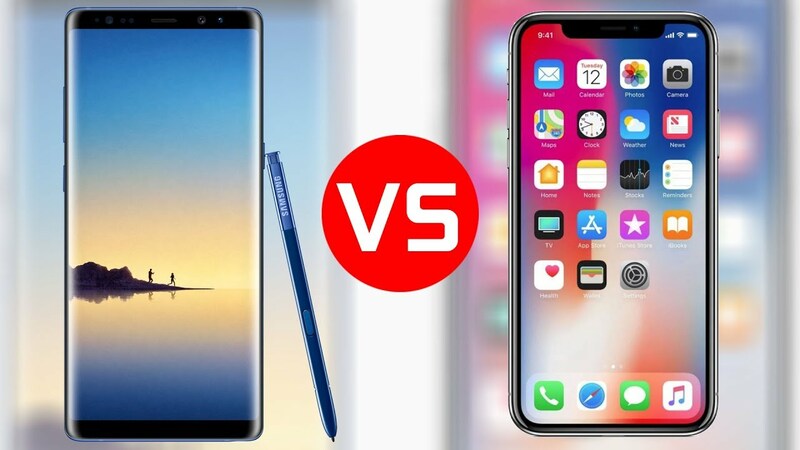 Will enterprise users buy a $1,000 smartphone from Apple or Samsung, and which one should they prefer? It depends on what enterprise features they value the most. The iPhone X and Galaxy Note 8 are similar in case size (162.5 x 74.8 x 8.6 for the Note 8 vs. 143.6 x 70.9 x 7.7 for the iPhone X) and screen (6.3 for Note 8 vs 5.8 for the iPhone X). When you hold the devices in your hand, they don’t really feel all that much different. 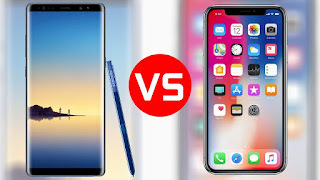 So, it’s likely neither device really has an advantage other than both are large and have big screens, which is important to a certain class of users. The display is a key user selection criteria. The iPhone X is Apple’s first device with an OLED screen. OLED offers much brighter and crisper displays, and Samsung has been using what it terms Super AMOLED for several generations. Since both have OLED displays, they should run close on visual appeal. But with a slightly larger display on the Galaxy Note 8 (1440×2960 pixels vs. 1125×2436) and the fact Samsung has been using Super AMOLED displays for some time, until we can have a head-to-head comparison, I give the advantage to the Note 8 on-screen appeal. This is a critical feature and its likely (although not yet certain) that the Galaxy Note 8 has the advantage. Apple hasn’t yet disclosed the size of the battery in the iPhone X other than saying it lasts a long time. But the Note 8 weighs about 20 grams more, and given the phones’ almost identical size, it’s likely this extra weight is due to a larger battery. Battery size is not a guarantee for how long it will last, but it’s a good indicator. In this case, with the information available, I’d give the advantage to the Note 8. Processors are at the heart of any device when performance counts, and with such premium devices expected to perform a large variety of tasks, it’s important to evaluate them. The iPhone X has Apple’s new A11 Bionic chip, while the Galaxy Note 8 (at least in the U.S.) incorporates Qualcomm’s highest performance Snapdragon 835. The A11 is a six-core device, while the Snapdragon 835 is an eight-core device. Cores alone don’t always determine superior performance, as optimized software and proper fine-tuning can have major impacts. And Apple has been very good at tuning for highest performance. But the Snapdragon 835 has proven itself in a number of high-end designs. In this case, until we have more performance data, I’d give Apple a slight edge based on its historic ability to optimize its overall device functionality. Memory is one of those things users don’t often think about until they need it. Both the Galaxy Note 8 and iPhone X come with 64GB in their minimum configuration. The iPhone also comes in a 256GB configuration at $150 more. But Samsung has provided a memory card slot in its devices, while Apple has not. That means the Note 8 can be upgraded. I give the advantage to Samsung on this one because of memory upgradability, while not always on the minds of initial purchasers, is one of those things that comes back to haunt you if you can’t manage when you really do download all those 4K videos. USB C vs. Lightning connectors is a hot debate. While this may be a minor point, it is nonetheless important, particularly in an enterprise setting. USB C is used by virtually all high-end phone makers other than Apple (at least on newer generation devices), as well as many tablets and notebooks. It’s relatively easy to find chargers and peripherals (and most are interchangeable across vendors). Of course, both devices feature wireless charging, but that’s not always available. Importantly for enterprise users, many peripherals are becoming available for USB C. For this reason, the Galaxy Note 8 has a significant advantage for enterprise users, and I give the Note 8 the edge here. Operating systems is one of those “religious” discussions. iOS has a very large and loyal following in the enterprise. But Android has been making significant inroads over the past couple of years, and Apple no longer commands the dominant lead it once had. Still, I have to give the iPhone X a slight edge here because it will appeal to an existing installed base that is quite loyal, particularly if they have already purchased a number of apps. Security is a key parameter that affects enterprise users in many more ways than the average consumer. Organizations need to ensure that users can log in securely and that the company can easily determine and deploy policies to access corporate resources. The Galaxy Note 8 (and S8 as well) can convert from a smartphone form factor to essentially a desktop device using its DeX capability. While not something consumers generally look for, it is appealing to a growing number of business people who want to carry just one device. Running VMware or Citrix on the device makes it compatible with most corporate apps, even when they are not ported to the device. I estimate 10 to 20 percent of users who select a Note 8 (or S8) indicate that DeX was a selection tipping point. In this case, DeX is a major competitive advantage that Apple and iPhone X currently don’t have. For companies exploring AR/VR, the iPhone X can utilize Apple’s ARKit and offers a preliminary advantage. The Galaxy Note 8 does have capability to get there, but currently Samsung has not placed as much emphasis on AR — although it has actively pursued VR primarily for consumer entertainment. It’s early, but for now, Apple has an advantage over Samsung and Android in general, even though I expect that will be short lived given Google’s ARCore efforts.